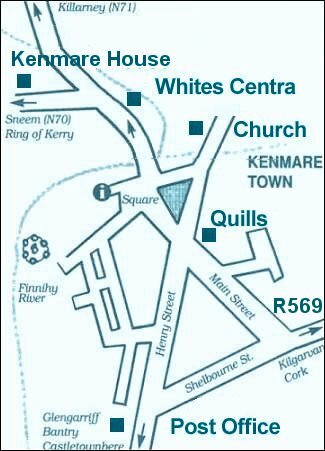 From Kenmare Town Centre take a left turn onto the N70 towards Sneem/Ring of Kerry. Kenmare House is 500M on the right. From Dublin Airport, take M1. Exit 9 to M50 South. Roundabout, 2nd exit South. Junction with M7 branch left, follow signs for Cork. Next roundabout, 2nd exit, through Kildare & Portlaoise. In Cashel follow signs for Cork. In Mitchelstown, follow signs for Killarney. In Mallow follow signs for Killarney. At Rathmore, take Kenmare road (N570). Two junctions on this road, first take the Kenmare road, second take left fork. At N22 junction, turn left. Continue until Salmon Leap Farm on right, turn right (R569). Straight on to Kenmare town. Go to Limerick from Shannon Airport. In Limerick, follow sign for Cork. Drive through Adare and Newcastle West. Follow signs for Tralee into Castleisland. At Castleisland, turn right onto the Main Street. Straight towards Farranfore. Turn left for Killarney and Cork. In Killarney, follow all the signs for Cork (N22). Continue on this road and after you see Salmon Leap Farm turn right, signposted Kenmare (R569). Straight on to Kenmare town. From Cork Airport, begin by heading towards Cork but then take the 1st roundabout and turn off towards Killarney via the sign for the N22. Pass through Macroom and Ballymageery and then take the Kenmare junction (Do not continue to Killarney). Pass through Killgarvan before reaching Kenmare. The journey by car is an estimated 1 3/4 hours. From Farranfore Airport turn left for Killarney. At Farranfore turn left. At Killarney, follow signs for Cork (N22) in order to bypass the town of Killarney. Stay on the N22 through junctions and roundabouts taking the Cork road. Continue along this road and after you see Salmon Leap Farm on the right turn right onto the R569. Straight on to Kenmare town.